Better late than never! My parents and sister endured the 6 hour trip down to be with us for the long Easter weekend and we were sure glad they did. I was spoiled seeing them more often when we lived in Hershey and I miss spending time with them. My Mom joined us for a "Welcome Spring" picnic at Kylee's school and got to see Ky in action with all her friends. We have loved her kindergarten experience and have been spoiled this year as I begin to research stuff in the Virginia Beach area....may I be wrong! We all know how skeptical I was for this year and look how it turned out...oh why do I worry so much. We have been spoiled with beautiful Spring weather and on Saturday enjo yed the outdoor downtown Charlottesville Mall and sitting outside for lunch finished by a fun ice skating event. 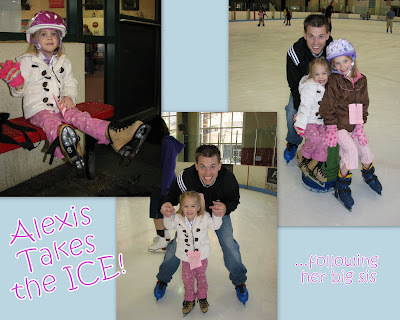 Kylee has been taking ice skating lessons and poor Alexis is left being the longing spectator all the time...so we finally go her out on the ice and Ky enjoyed practicing her moves. It was quite the event as my sister Heather showed us her stuff on the ice and even Grandma got out there too. We sure know how to get the most out of our free coupons and both girls were feeling proud. 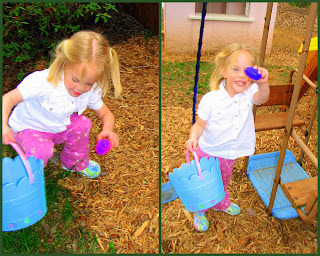 Easter festivities included: coloring eggs of course, a fun Easter egg hunt with the neighbors in the adjoining backyards and with out a doubt an exciting visit from the Easter Bunny. Lexi sure got into hunting for eggs this year and did a great job watching over them. "mo m, make sure Ky doesn't touch mine." Hot and cold was always a fun one growing up which grandpa put into practice for Ky this year. The girls found their Easter baskets in the van at the end of their scavenger hunt and the excitement in their voices, especially Kylee as she pulls out and explains how awesome each item in the basket is is just priceless and sure makes the Easter Bunny feel really good. Highlights were, Lexi's swimming barbie (just like Ky's and now she has her own), fairies with their own flowers, pez, flip-flops and flowers to plant...kept them busy for a little while. Oh and I can't forget a yummy prime rib dinner by my parents and Conference. 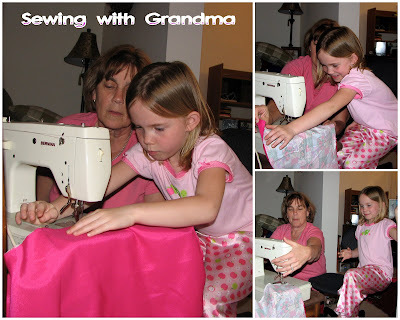 Before our good-bye Kylee had some great Grand-ma moments as G-ma worked on teaching her how to sew. Kylee has been dying to get the chance to sew on her own and this is just something her Mother CAN'T teach her. It cracks me up that even when she gets a hole in something she will ask me to set it aside till Grandma comes and can fix it!!!!! Ooops. She was in heaven as she helped Grandma make her a new BIG Silky and one for Lexi too. She caught on quick and had some serious concentration as you can see. I love her proud and amazed facial expressi ons and really got a kick out of listening to her explain to me what to do as we attempted a little pillow in the morning before Grandma woke up. I gladly let G-ma take over as they got back to work in the morning making a Silky for Elizabeth (her baby doll) and one for Alexis too as she tries hard not to leave her out or knows if she has her own maybe just maybe she will leave her stuff alone...worth a try. Kylee couldn't get enough and wants Grandma to bring her sewing machine back again next time which will be a must anyway since I always have some project for her. This time we even tailored a swimsuit for Ky so it will fit her the way she wants. I loved watching them work together and can't believe how grown up my little girl is getting. I'm truly thankful for family and over Easter enjoyed reflecting on the resurrection of our Savior and thankful for all he has done for me making it possible for me to be with this family for eternity. It sounds like a very special weekend with your family! I enjoyed the pictures! Spring is so great. It looks like you guys have been busy. Alexis skating, that it very neat that she was interested in doing it like Kylee. I can't believe how big she has gotten. Ted was telling me how he is coming out in July to move you guys and that I could come too. Virginia Beach sounds very nice, are you excited? How fun!!! Darling girls and Cute pictures as always! I am glad you got some good ones with mom, Dad, and Heather even. I didn't know that Kylee helped mom with the sewing ... that is pretty precious. The easter festivities look like a blast. Way to go on pulling everything off, even letting Heather show you her skating moves. Taylor and I have both wanted to see her on the ice.